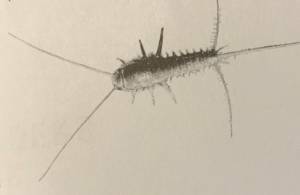 Silverfish are a pest that you probably don’t realise you have unless they get out of control, or if you stumble upon one during a late night trip to the bathroom. We sometimes see them run away as the light comes on or meet one in a wardrobe and then think little of it as if it was a one-off encounter. The problem is that an uncontrolled population can be a big issue. The question we get asked a lot is how to control silverfish numbers and get rid of them around the home or office. For a successful silverfish treatment, it’s best to use a pest control company that has a good understanding of their feeding and harbouring habits. Silverfish get their name from the silver, scaly appearance of their tapered bodies. Adults can grow fairly large and metallic-looking, at a couple of centimetres, while the young are small, pale and easy to miss. They are nocturnal creatures that have become accustomed to the surroundings of a home, where there were once happy enough rooting around in leaf litter and bark. We mostly see them at night, unless disturbed from a hiding place during the day. They are quick and agile and won’t stick around long if spotted. The biggest problem here is that Silverfish have a love of starchy food and proteins that are best served via paper and cloth. This is why we are most likely to find them on our bookshelves. If you spot one hiding in a book or on the shelf, there is a good chance that a further colony of them is somewhere nearby undisturbed. It is incredibly annoying to find little scuff marks and holes in the pages and covers of a book. It can be even worse if these creatures find their way into our photo albums and start munching through our treasured memories. It is worth checking any books and albums like this, as well as wardrobes and drawers of clothes. These insects also like to eat glue, mould and dead insects. In a way, they provide their own little cleaning service, but at a cost. When a silverfish problem occurs cleaning and secondary pest treatments are required until they have been fully eliminated. Once fully eradicated it is best to do regular cleaning and vacuuming of harbouring areas. The most annoying aspect of living with silverfish means that we need to keep on top of the problem as much as possible. One of the easiest first steps is to keep checking and rearranging those shelves with books, photo albums and other items of paper. This stops the large adults from becoming too comfortable in one spot, taking over with the rest of the colony and causing havoc. Silverfish will harbour on bookcases, clothes or draws they also will retreat to cavities behind furniture and walls, such as gaps in skirting boards. The next step here is to flush them out or seal up escape routes to stop further infestations. Large-scale problems in need of more professional help require the actions of a professional cleaning service followed with a pest treatment to suit. At Sunnystate Pest Control, we have a choice of both chemical and non-chemical treatment options that homeowners can employ for the best results. This includes a more thorough survey of the home in those hard to reach places behind the walls, as well as a more substantial flushing solution.